Breakfast from America's Original Butcher looks like this - hearty skillets sizzling with meaty classics made right. These new Butcher's Breakfasts put real, lean Omaha Steaks meats, high-quality ingredients, and big-flavor recipes on your table… plus, we've done all the work. 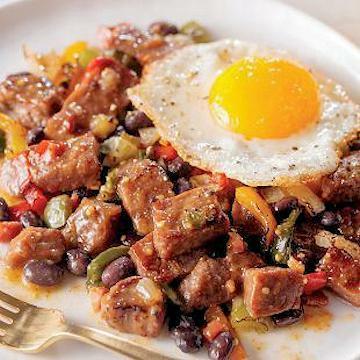 Ranchero Steak and Beans puts a Southwestern twist on the hearty classic breakfast. There's plenty of tender, seasoned steak, mixed with savory uncured bacon, fire-roasted tomatoes, tomatillos, green chiles, green & poblano peppers, and onion all sauteed in a sauce of lime juice, chili peppers, and sweet paprika. It's not spicy, but it's bold. This meal is a beefy, hearty start to a special day. Open bag, remove sauce pouch. Place sauce pouch in bowl of hot water. Preheat 10" nonstick skillet to medium, add 1T. oil and contents of bag..�Cover and cook 8 minutes, stirring occasionally..�Uncover, add thawed sauce pouch and increase heat to medium-high.�Cook uncovered for 3 minutes, stirring occasionally until sauce is hot and bubbling.�Remove from heat and place contents of skillet meal into serving dishes. If desired top with your choice of cooked egg. Ingredients: COOKED SEASONED BEEF STEAK STRIPS (BEEF, BEEF BROTH, CONTAINS LESS THAN 2% SALT, BROWN SUGAR, SEASONING [TURBINADO SUGAR, SODIUM CARBONATE, SEA SALT, FLAVOR], WHITE PEPPER, SPICE EXTRACTIVES), COOKED BLACK BEANS, PEPPERS, WATER, POBLANO PEPPERS, ONIONS, TOMATILLOS (TOMATILLOS, CITRIC ACID), BACON PIECES (BACON CURED WITH WATER, SALT, SUGAR, SODIUM PHOSPHATE, SODIUM ERYTHORBATE, SODIUM NITRITE), GREEN CHILES, FIRE ROASTED TOMATOES (TOMATOES, TOMATO JUICE, SALT, CITRIC ACID, CALCIUM CHLORIDE), SPICES, GARLIC PUREE, CHICKEN STOCK BASE (CHICKEN STOCK, CHICKEN FLAVOR, SEA SALT, YEAST EXTRACT, CHICKEN FAT, GARLIC POWDER, VEGETABLE STOCK [CARROT, CELERY, ONION], BAY, THYME, MARJORAM, CARROT POWDER), CANOLA OIL, CORN STARCH, SALT, LIME JUICE CONCENTRATE, CHILI CHIPOTLE PEPPER CONCENTRATE (RED CHILI PEPPERS, CHIPOTLE PEPPERS, SALT, FLAVORING, NATURAL LIQUID SMOKE FLAVORINGS), CHIPOTLE MORITA POWDER (DRIED CHIPOTLE CHILES), DRIED ANCHO CHILES, SWEET SMOKED PAPRIKA.